As seen on HGTV and in Cowboys & Indians Magazine, Nizhoni Ranch gallery is located in an old ranch house, one hour southeast of Tucson. Featuring Navajo Textiles, Native American Baskets, Pottery, and North American Indian hand-made treasures. We invite you to immerse yourself in all things Nizhoni (Beautiful in Navajo). We look forward to meeting you soon and assisting you with your search for Navajo Rugs & more, online or in person! Looking for Navajo rugs? Navajo blankets? You are in THE right place! Navajo rugs authority Steve Getzwiller is pleased to offer you the finest Native American Indian Navajo weavings available today! The Navajo Churro Collection pieces are commissioned by Steve Getzwiller and are superior works of art created with special dyes and the finest select materials. You cannot find this level of quality anywhere else. You are among an elite group of Navajo Textile & Art collectors. All Nizhoni Ranch Gallery Navajo Weavings are accompanied by a Certificate of Authenticity. Browse a sampling of our extensive inventory of Navajo Rugs for sale starting with our Navajo Churro Collection and our Historic Navajo Weaving collection. Or click for all Navajo Rugs for Sale. Enjoy! Want to see Great Navajo Rugs in Person? Saddle up and come to Sonoita Arizona! Located just 30 miles Southeast of Tucson, less than 1 hour from the Tucson Airport, Sonoita Arizona is a beautiful spot tucked between the Santa Rita, Mustang, and Huachuca Mountains; wineries, bird watching, horseback riding, hiking and more. Nizhoni means beautiful place in Navajo. The Nizhoni Ranch Gallery offers you the finest in contemporary and historic Navajo weaving as well as other select Native American Indian art forms. Native American Baskets. Pottery. Kachinas. Jewelry. Steve Getzwiller is a leading authority on Navajo blankets and textiles. He has been a collector, trader, and collaborative innovator of Navajo weaving for over 35 years. This site has a representation of Navajo rugs available. Please inquire for pricing. If you do not see what you are looking for we will be glad to help you find it! See more Navajo Rugs than displayed online!! Just call ahead for directions 520-455-5020. Over 100,000 copies of Steve’s book the Fine Art of Navajo Weaving have been sold. "The Fine Art of Navajo Weaving" is published with, and photographed by Ray Manley. This book is available to give some basic understanding of the Navajo Weaver and their Art Form. Over 100,000 copies sold. Out of print only a few copies are still available. The Fine Art of Navajo Weaving – Softbound – Autographed copy. Very Limited Editions are available. In the last 200 years, Navajo Weaving has come a long way: from the shoulder, to the floor, to a place of distinction on the gallery wall. 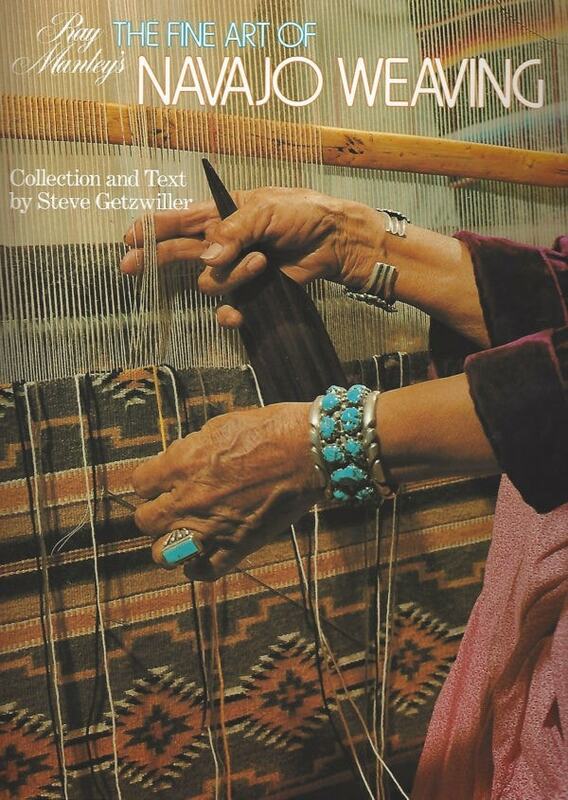 A book showcasing historic Navajo saddle blankets from the Steve Getzwiller collection. There is an artistic quality and inherent freedom of expression reflected in many of these early Navajo saddle blankets of rare beauty. Learn about the indigenous native american indians and their gift of weaving. Ganado, Two Grey Hills, Chinle, Teec Nos Pos, Bistie, Storm Pattern, JB Moore, Crystal … all of your favorites are waiting for you here. Foreword by Peter Iverson, Author & Professor. 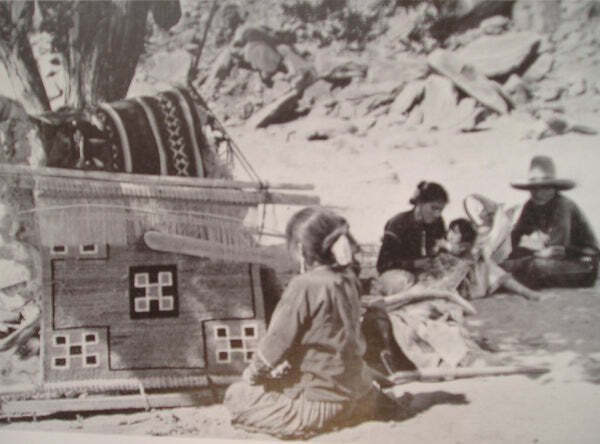 Catalog has 42 examples of Navajo saddle blankets dating from the 1870s to 1940s. All blankets were on exhibit at the Desert Caballeros Western Museum in Wickenburg Arizona. There are many tales and stories regarding the rich Navajo history in America. None may be more intriguing and exciting than that of the infamous Spider Woman. A deity that holds a special place in the Navajo culture, it is believed that she is the one that taught the Navajo to weave. It’s said that the first loom was made from sky and earth cords, and that the weave itself was made from sunlight, lightning, crystals and white shells. The truth, however, is the Pueblo people taught the Navajo how to create Native American hand-woven blankets. In fact, Navajo artists were influenced in part by the Spanish who had introduced cotton to the Pueblo long before 1650. Use the main navigation above or click here for the Navajo Churro Collection, Historic Navajo Weaving, Contemporary Navajo rugs, newly added Navajo Rugs, or click here for all Navajo Rugs for sale!